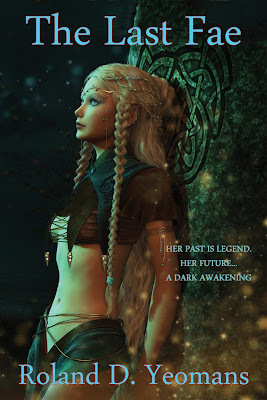 Do You Love Tales of Celtic Myth, Faes, Alternate Histories, and Strong Heroines? The spark of an anguished soul flew past me in the night. I shivered as her light drew back the curtains of my mind. I would have cursed her had she lingered. But Death was impatient. Words breathed through the mists of my awareness. "Darkness yet in light. To live half dead, a living death. And buried but yet more miserable. My self. My sepulcher." My mind roughly brushed aside the dry leaves of Milton's broodings. No time for self-pity. Yet too much time for all eternity. Enough! I was here for a reason. And as always that reason was death. Always death. The why was unimportant. There was always a logical why for Abbadon. I reached out with more than my ears. My spirit shuddered as the ragged claws of madness raked it from down the hall. An asylum. A Sidhe imprisoned within a madhouse. How utterly fitting. I ran my long fingers along the rough sheet beneath me. A state asylum obviously. Even better. But what state? My awakening consciousness was stubborn in its ignorance. I bunched up the sheet in my fist in hot frustration. A sharp intake of breath from the next bed. Her scent came to me. I smiled. Only a human. I flicked my eyes to the barred window. The glass. Thick, dense. Like the humans who made it. Under my fingertips a pebble. I nodded. A mere speck of stone. But it would do. The pebble shot from between my thumb and forefinger like a bullet. An electric circuit died, wailing its death song in tones higher than humans could hear. I smiled like a wolf. We would have visitors soon. More the pity for them. I drew in a breath from the cold breeze bleeding from the wounded window. The sharp tang of Autumn. Oak. Ash. Thorn. Decay. Rotting leaves, mottled in bright hues of strangled life. The dark and bloody soil beneath them breathed out its lineage. An aching sadness hollowed out my chest. The Misty Isles. Albion. England. I whispered, the words feeling like dewdrops of blood on a wounded deer, "The lonely season in lonely lands." Wow, you're prolific, Roland. And the cover is beautiful--did you design it? Heather McCorkle designed it. Isn't it beautiful? 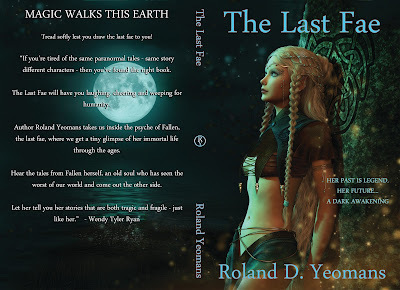 THE LAST FAE is one of my older books that is out in Kindle and Audio already. I wanted another paperback to sell at my author's table.